What is a compact rifle scope? Actually, comp act rifle scopes are not something new. In fact, they are just a smaller lightweight copy of an ordinary rifle scope. 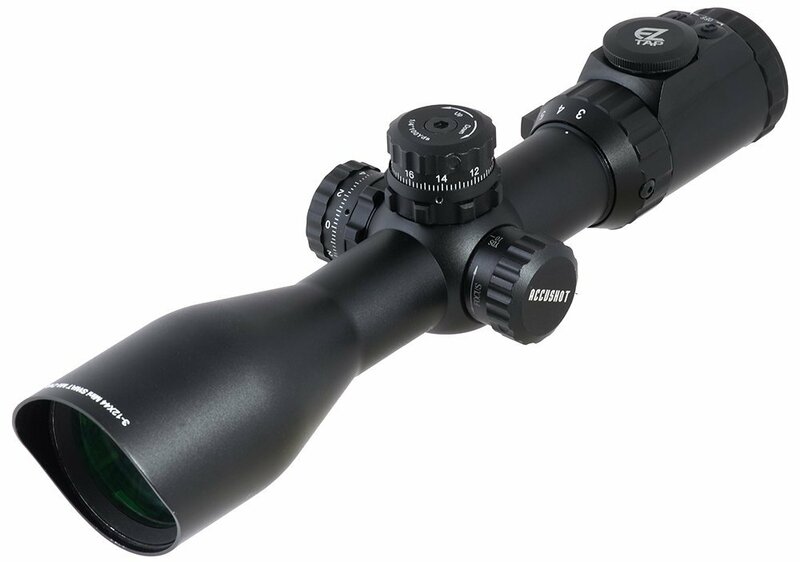 Such rifle scopes offer all the qualities and significant features found in its bigger brothers, but with an emphasis on compactness and lightweight design. Compact rifle scopes found its use for a number of different situations that imply shooting, for example, hunting, military and police operations, shooting competitions. Lightweight design is the first and foremost advantage of a compact rifle scope. Such scopes are the best choice for hunting, target and tactical shooting as your rifle does not become overweighted and is easy to carry. The smaller size of compact rifle scopes means practically the same as the first advantage does. It enables you to carry a rifle without a risk of bumping the scope against trees, rocks, any barriers whether you are going through a dense forest, a narrow ravine or other locations. Due to the fact, that compact rifle scopes have a small size and lightweight design, they can offer multiple mounting possibilities. It means that such rifle scopes can be mounted not only on rifles (a perfect match is a short action rifle) but also on submachine guns, handguns, archery equipment. 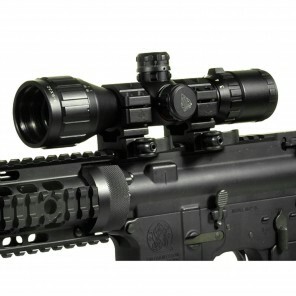 Moreover, a smaller objective of most compact rifle scopes provides more accurate shooting. 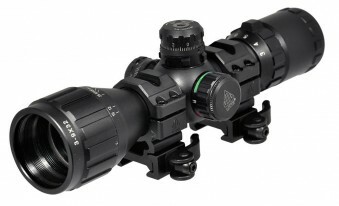 + The rifle scope was designed on the base of a brand-new True Strength (TS) platform, including a Smart Spherical Structure(SSS), which helps control the joint-like interaction between the inner and outer tubes of the scope and guarantees accurate windage & elevation adjustment over a long time. 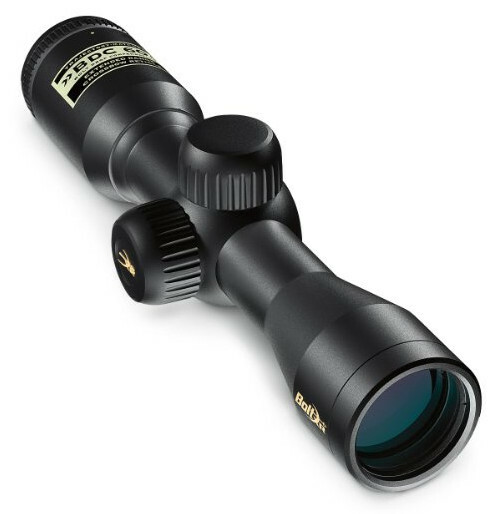 + Top-quality lockable and resettable scope’s turrets enable you to make the most precise adjustments for a nice shot and prevent from losing previously set ones. 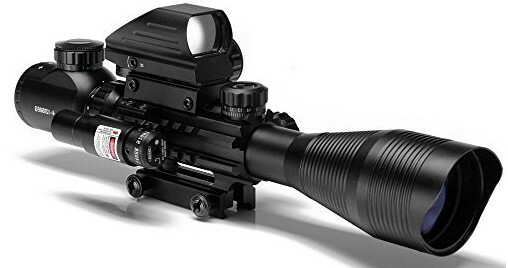 In addition, the rifle scope is accompanied with a side wheel adjustable turret (SWAT AO), which cinches an unparalleled parallax-free view from 10 yards up to no limit. + The scope has a unique built-in Illumination Enhancing(IE) technology, providing traditional red/green dual color and 36-color personalized mode, letting you handle any environmental or weather conditions. The system is convenient for colorblind people, who are able to adopt the rifle scope to their eyesight. + The rifle scope includes a special reticle. Unlike common ones, the Tactical Range Estimating (TRE) mil-dot reticle has 9 dots on each direction of the cross hair, which means you have 19/21 aiming points. + UTG Compact scope holds zero even when used with heavy recoil rifles. + The scope has multi emerald coated lenses plus integrated angled front sunshade. + The rifle scope comes with rings, scope lenses cover and tools for mounting. – Though the scope is small, it occurs to be a bit heavy. – It uses batteries rather quickly. Get this scope at a reasonable price on Amazon right now! Tactical Range Estimating(TRE) mil-dot reticle with 9 dots on each crosshair direction, providing 19/21 aiming points. UTG 3-9×32 Compact CQB Bug Buster Scope is shock-, fog- and waterproof, which allows you to use it despite any adverse weather conditions. The optics is extremely sharp, paying attention to the low price. 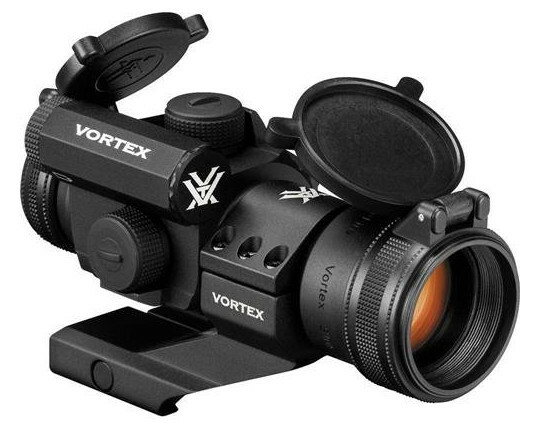 The rifle scope provides you with a parallax-free view from the distance of only 3 yards to infinity. The scope is complemented with RGB side wheel green & red illumination, providing customers with an easy access for reticle light. It is accompanied with mounting rings and lens covers. The third one in our list of the best compact rifle scopes is Aim Sports Compact Rangfinder Rifle Scope – a cheap small-sized rifle scope that has all important features and components for a great work. + Aim Sports Compact Rangfinder Scope is a good choice for plinking and varmint hunting. 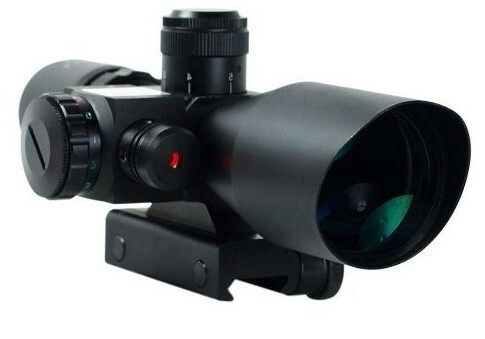 + The rifle scope will suit any weaver or picatinny rail. + The elevation and windage adjustments are clearly marked and easy used. There are four marks on the adjustment knob, the value of each is 1/4-MOA. One-MOA moves the aiming point at 100 yards by 1inch. + You will have no issues with installation for sure (the scope comes with mounting rings). + It is one of the best compact rifle scopes for the money. – The rifle scope doesn’t have any sunshade or the way to mount the one, that is why it is supposed to reflect heavily. – The eye relief is rather short. 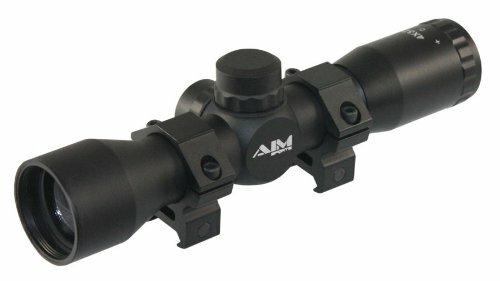 – Aim Sports Compact Rangfinder Scope does not have a variable zoom. These are very cheap scopes. Any mid range recommendations?